Sunset Grill is now Chennai's hottest joint, with good reason. 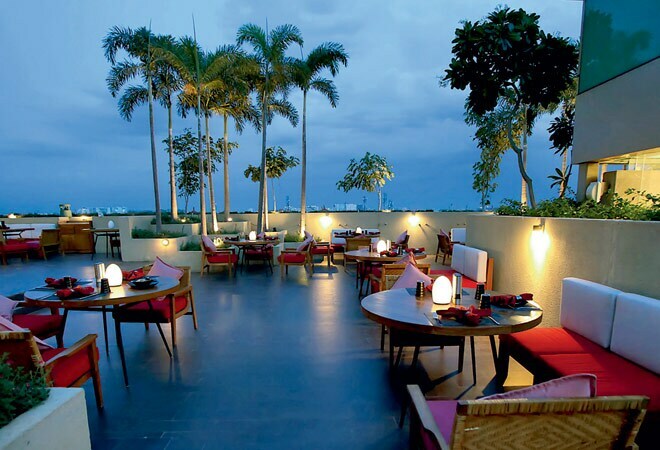 There are a great many things that go in favour of the Westin Chennai, the foremost being the fact that it's the only five-star hotel that caters to the Velachery-OMR belt and its substantial IT populace. So, when they opened their third F&B outlet, a 52-cover alfresco grill house, it caused quite a buzz among software professionals looking for a weekend haunt. The new restaurant, Sunset Grill, takes one of the property's prettiest spots on the second level, above the pool, in a canopy of palm trees and flowering plants. It serves classics from the Arabian, Middle Eastern, European and Indian cuisines with a focus on the original flavours. While there is a tendency to steer clear of restaurants tha t are 'multi-cuisine', this one does not disappoint. Open only for dinner, the meal at Sunset Grill is best enjoyed at a leisurely pace. You should begin with one of the appertisers. I would recommend the bharwan-ekhumb (mushrooms filled with cheese and sp ices, cooked in tandoor) and periperi prawns (spicy and zesty marinade, pan grilled, with an incredible periperi sauce made in-house). Both are exceptional. The mains have all-time classics like tenderloin steak, t-bone steak and Norwegian salmon - which also happens to be a Westin specialty. The jumbo prawns melt in your mouth, and are easily the best you can find. However, we thought traditional dishes like the Bratwurst sausages should have been more refined in preparation and flavour. You can also opt for their signatures - the baby back barbeque ribs (18 oz jumbo melting ribs with Oklahoma fries, bean cassoulet and grilled green onions) and Brazilian mixed grill (pork belly, churrasco sausages, tenderloin flanks, chicken drumsticks and beef liver served with Oklahoma fries and garden salad). End the meal with the heavenly New York cheesecake and mango coulis, which floors you with an explosion of striking flavours.